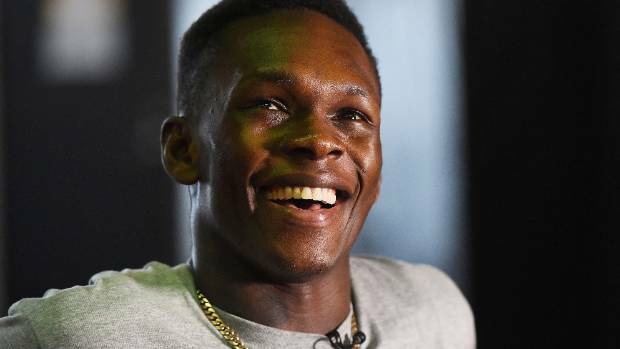 Israel Adesanya - Top or Bottom? Discussion in 'The Lightweights' started by Blanqa Blanqua, Apr 15, 2019. So here's two pics. Which do you prefer: Top or Bottom? Also you can say which you think he likes too if you want. Side note: Jon Jones need to STFU @Ing this kid. Israel is winning without the steroids and without the eye pokes so F U Jones. BoD 2.0, Ryoto Machida, Threetrees and 7 others like this. Yosuke, Moonwalker95 and ChumpyKiwi like this. BoD 2.0, JbModest, Ryoto Machida and 4 others like this. weak attempt op, pathetic even. ILove4MinutesHyuna, clivers, HHJ and 3 others like this. Jon Jones need to STFU @Ing this kid. Hespectfully, clivers, Dragon Punch and 3 others like this. You and Israel in this scene. You wanna be pink Mohawk guy or backwards hat guy? Wanna be "'let me bang' bro" or "'let the bro bang' bro"? JbModest and ixRanGzeNxi like this. While I have no doubt that Israel can toy Jones in any kind of stand up fight, Jones will just use his superior wrassling and strength to dominate him on the ground. Honestly if you just go off his Instagram he is Gay. Good for him him if he is. My Brother has met him (my brother is gay) and he reckons Israel is pretty openly gay. (Shrug) I think it would be a good thing if he was. We do. We do let you bang. clivers and ixRanGzeNxi like this. That look from Mike Ricci is the single funniest TUF moment. We do. We do let you bang, bro. Brit_Brawler and peacemaster like this. I think so. He would be more unique I suppose. Probably get huge media attention. Could boost his pay checks.